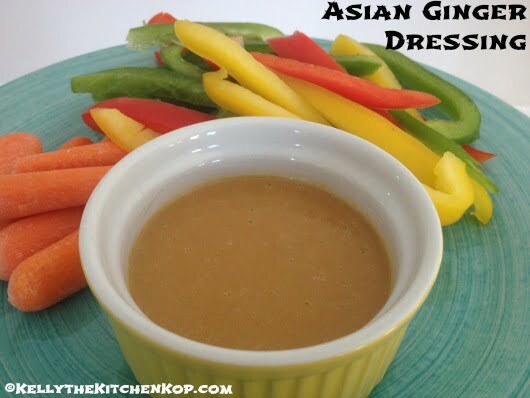 Do you love the taste of an Asian Ginger Salad Dressing?! It was nice to get a success in my kitchen today, since food flops are so familiar to me! 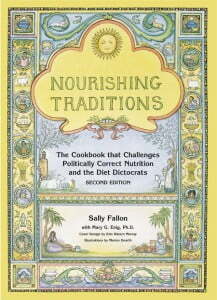 One thing Sally Fallon (author of Nourishing Traditions and WAPF Foundation founder) has always said, when asked how someone should start out in making the switch to real food, is that they should begin by making their own salad dressings, because it truly is SO simple. Just a warning, though: This recipe has a LOT of flavor. If you like your food more mild, you'll want to decrease some of the ginger and/or the garlic, and omit the cayenne all together. We are wild about super flavorful foods around here, though, even the kids couldn't stop eating it! I used my food processor (with that handly little side-scraper attachment you see there), but next time I'm going to make a much bigger batch and use the blender (which came with my beloved Bosch), that way I won't worry about it coming out the sides as it was starting to do a little bit with even this smaller batch. Throw everything into your food processor or blender and mix until it's all smooth. Easy! Makes almost 2 cups. More salad recipes are here in my salad index post! Or check out Kristen's Simply Salads by Season e-book! Well it’s been so long since I was at Outback, I’m sorry I don’t know if it tastes the same, but I can tell you that this recipe is REALLY tasty, and it’ll probably be close since it does have both ginger and soy in it. 🙂 If you try it, let me know if it tastes the same, okay? This was perfect. We loved it. Served with a baby spring mix, baby romaine, green onions, seedless cucumber, warm walnuts and dried cranberries. It was wonderful! Thank you! I agree that your recipe has more bold flavor than the dressing normally served in the restaurant. I added about 50% more sugar and also added some water to cut back on the spicy flavors. Definitely yummy! Thanks! I fixed a salad and prepared this dressing. I had toasted sesame oil and lessened the ginger because small children would be eating it. SO yummy! I’ll add more ginger the next time. Thank you for all you do! I used up my cornstarch because I just don’t trust corn any more, sadly. I use arrowroot flour instead, now. Thank you for this delicious recipe! Looks great, we love that dressing and will definitely try it! Just wondering which ingredient gives it the orange color? This looks good, I’m definitely trying it! I wonder if coconut aminos would work instead of the soy sauce, I have some of those in my cupboard already. 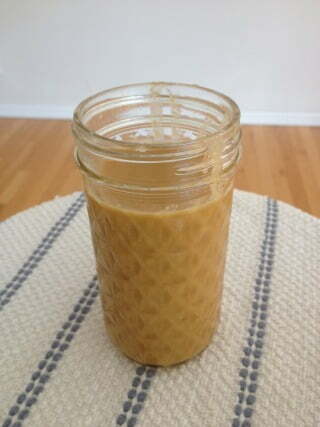 Coconut aminos would work – they are very similar to soy sauce. Someone in the family is allergic to sesame. Would mac nut oil be a good replacement?